With the dawning of the twentieth century, a long forgotten culture has been rediscovered in the Anatolian Highlands of Asia Minor. This ancient civilization, Urartu (pronounced oo-rar'-too), which was centered about Lake Van, flourished from the ninth to the sixth century B.C., extending from Lake Urmia in the east to North Syria in the west. During its three hundred years of existence, the Urartian Empire was a formidable power. Later, it was vanquished and disappeared from the memory of man. The land occupied by the Urartians has played a prominent part in the agelong universe ministry to and on our planet reported in The URANTIA Book. The pendulum of world destiny turned in that direction long before the recall of modern man. Though darkness and death reigned outside the settlement, loyal midway sentries were ever vigilant. Van and Amadon had the priceless tree of life, appropriated by loyal cherbim, seraphim, and midway creatures at the outbreak of the rebellion. By partaking of the fruit and leaves of this tree, within which circulated superhuman energies, these two beings, whose bodies contained the organic complement of the system life circuits, were able to live on indefinitely. Those of their loyal material and semimaterial comrades whose bodies were similarly constituted were also thus able to lead an immortal existence. Their disloyal counterparts in Dalamatia, however, finding themselves shut off from this life ministry, were faced with certain mortal death and dissolution. The outbreak of rebellion had thrown the interplanetary circuits silent by quarantine. For seven anxious years, the loyalists waited to learn of their status with the universe authorities. At last a messenger came, with news vindicating their actions in defying the Prince. Turning finally and forever from the former city of promise as it lay (possibly) at the (then) mouth of the Persian Gulf, the group traveled across the expanse of the Mesopotamian plain to the abrupt wall of the bordering highlands. Leaving behind the dust of Mesopotamia, they entered the highlands--and a rendezvous with destiny. Soon after this relocation, all of Van and Amadon's loyal material and semimaterial associates of immortality status were translated from Urantia to system headquarters, and Van was invested as titular head of all superhuman personalities on Urantia. From these secluded heights, within one thousand years, Van and Amadon established three hundred and fifty settlements of people loyal to the plan of mortal progression and universe cooperation. This network stretched from Lake Van eastward to the region of the southern Caspian Sea and on to the foothills of the Kopet Daugh, in Turkestan, which we are led in The URANTIA Book to believe was the eastern terminus of the Vannic network and also the primary headquarters of Van and Amadon. ABOVE RIGHT: THE MESOPOTAMIAN WALL. ABOVE LEFT: THE GREAT CITADEL ROCK AT VAN. For one hundred and fifty thousand years, Van and Amadon led the highland descendants of their original human followers in laboring for the uplift of the world. For untold generations, legends grew about these two immortal ministers of God who continued to live and work among men. Gradually, Van and Amadon came to be viewed as divine or near-divine personages and were woven into the spreading traditions, superstitions, and religions of mankind. After the dispatch of a material son and daughter to Urantia had been approved on high, Van and Amadon led their followers in preparing a garden site for the couple. Thirty-seven thousand years ago, Adam and Eve arrived and took up the administration of Urantia. Van and Amadon had transplanted the tree of life to the Garden of Eden for the use of the Adamic couple. Shortly after Adam and Eve arrived, Van and Amadon returned to system headquarters, after nearly half a million years of ministering on this small and needy world, leaving behind them a truly living legacy. The earliest recorded mention of Urartu is in ancient Assyrian inscriptions of the thirteenth century B.C., a time before Urartu had become consolidated as a state. At that time, the Assyrians applied the term Uruartri to the loose groupings of people in the region where Urartu was later to appear. The Assyrians also referred to these peoples as the Nairi. (Could this be connected with the Nerites referred to in The URANTIA Book?). In the year 860 B.C., the Urartian kingdom was formed under its first king, Aramu, and the Assyrians began referring to the new nation as Urartu. The Urartians, however, referred to their country as the land of Biaini. Scholars somehow derive the word Van, as in Lake Van (and perhaps nearby Lake Sevan), from the word Biaini and sometimes refer to Urartu as the Kingdom of Van. 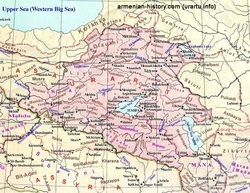 "The name was preserved in the Old Testament in the corrupt form 'Ararat,' which in the Latin version became 'Armenia.' When the Massoretic writers were vocalising the text of the Bible they inserted the vowel a into words which were unknown to them, so that 'Urartu' became 'Ararat'; and it is only within very recent years that the Qumran scrolls have yielded a form of the name with the semi-vowel w in the first syllable." "A passage in the Book of Jeremia dated to the fourth year of the reign of King Zedekiah (i.e., 594 B.C.) talks of calling together against Babylon the Medes, the Urartians ('Ararat'), the Mannaeans ('Minni') and the Scythians ('Aschenaz')". It is generally agreed that the Urartians arose from the Hurrians and employed a language similar to Hurrian. These mountaineers built great fortresses on overlooks throughout the highlands of Urartu. Their kingdom supported huge building programs. Palace remains show evidence of economic might. Much of their art has been recovered, particularly works in bronze. The art of Urartu contains abundant depictions referring to the Cult of the Tree--images of sacred trees guarded by seraphim and genii and sometimes attended by a king or kings. Extreme stylization of tree indicates that tradition was already ancient. (Urartian, detail of bronze helmet of King Sarduri II, 760-743 B.C. Hermitage Museum, Leningrad). This persistent portrayal of the tree of life with its guarding celestial beings pervaded the Urartian culture. For generations, personal seals imprinted the sacred tree on correspondence carried throughout the empire. Rulers and administrators sipped wine from bronze cups stamped with the emblem of the tree. Urartian warriors carried the symbol of the sacred tree to battle on bronze belts and pointed helmets. Carved stones displayed the sacred tree throughout the land. Colorful wall paintings and carved columns in palaces and other buildings repeated the recurring theme. (Urartian, 8th Century B.C Armenian Historical Museum, Yrevan). "Rusa, king of Urartu, heard of the mightiness of my gods and was overcome by terror at my majesty. Then he sent his princes to Arbela to bring me greetings". In 590 B.C., Urartu was sacked and burned. Only hulks remained. The dust and winds of time did their work. It was not until about a hundred years ago that researchers began to connect the ruins throughout the Anatolian highlands with the vague references to Urartu in the Assyrian records; it had previously been believed that they were Assyrian. Not until 1936 was the first systematic excavation of a major Urartian fortress begun. After the disappearance of Urartu as a political entity, the Armenians dominated the ancient highlands, absorbing portions of the previous Urartian culture in the process. More recently the Armenians, like their Urartian predecessors, have met tragic and depopulating devastation in these ancestral homelands. The hand of fate seems not yet to have completed its drama of violent readjustment in the Anatolian highlands. A casual reading of The URANTIA Book might give the impression that Van's headquarters were primarily in the Lake Van area. A more detailed analysis and comparison of statements in The URANTIA Book indicates, however, that Van's principal headquarters were in the foothills south of the Kopet Daugh, where Adamson subsequently settled. In this connection, The URANTIA Book explains that the Vanites (early followers of Van) and their descendants later settled about the shores of Lake Van and their subsequent traditions developed around this area. It would be interesting to speculate on the racial makeup of the early followers of Van and their relationship to the better known peoples of today: the Armenians, for example. This is a subject for another study. We know that the human followers of Van and Amadon who subsequently reproduced--the non-immortal individuals--were of the Andonite race, as were their modified human followers, none of whom reproduced. We also know that the ascendant corporeal volunteers resembled their modified associates, at least in skin color. The bodies of these rematerialized volunteers were of the same order as the body of later-appearing Machiventa Melchizedek, who was similarly supplied with a fabricated body for special planetary service; in personal appearance, Machiventa Melchizedek resembled the people around him, but he possessed a commanding presence. The early Andonites, half a million years before Van and Amadon, somewhat resembled present-day Eskimos both in general appearance and skin color. We do not know how much change occurred in the Andonic race during the intervening one-half million years before the times of Van and Amadon. The Nodites, being descendants of the modified Andonites, underwent some changes because of artificially encountered mutations, but might have kept a skin color similar to that of the Andonites. The later-appearing Adamsonites in the Turkestani locale previously inhabited by Van and Amadon were the ancestors of the early Greeks. Events of vast significance have occurred in that small area of the world, ringing down their consequences through the ages. Perhaps some day we shall know more about this subject. One thing is becoming increasingly clear: The modern revelation contained in The URANTIA Book is not merely a theoretical article of belief to be sheltered from all links with external reality. Even the word Urantia, which we URANTIA Book readers know as the name of our planet, is not, it now seems, new to this world (a possibility that brings a comforting sense of continuity with the past): the similarity between Urantian and Urartian is too close--the ubiquity of the Ur prefix too universal. Perhaps someday scholars will find a new inscription or discover a new language fact and show that the exact term Urantia has been in widespread use on our world for ages upon ages. The word Urantia, the revealed universe name of our planet, was known to Van. Derivatives of this word have abounded in the area where Van dwelt, working their way into the languages and traditions of men since time immemorial. Some are obvious, while others are speculative: Urartu--Ur--King Ursa--Ural Mountains. Perhaps it is wrong to look to ancient definitions of the word Ur and its derivatives to find clues to the significance of the name Urantia. Perhaps, as a revealed name, this word has given all human languages their variously and imperfectly perceived interpretations of the true universe meaning of the prefix Ur. It might seem strange that the Urartians referred to themselves as Biaini and not Urartians, but one hundred and fifty thousand years of fraternizing with an immortal, yet visible, being seems a valid experience to celebrate in one's racial and cultural name. It might also seem strange that it was the Assyrians who used the word Urartu. But The URANTIA Book, a masterpiece of correlation, has answers for many questions as they arise, even those hardly humanly foreseeable at the time of its writing. A small phrase among the more than one million superb words in this book simply informs us that the early Vanites were the ancestors of the Assyrians. Map of the World showing Urartu-Cilicia, circa 1,500 B.C. In the early twentieth century, a long forgotten magnificent kingdom and a cradle of civilization was rediscovered in the Anatolian highlands of Asia Minor. Not until 1936 was the first systematic and scientific excavation of an edifice or a fortress of that lost civilization begun. And that was, the ancient Kingdom of Urartu (a name created by the Assyrians) which was centered around Lake Van. Sometimes, historians refer to Urartu as the kingdom of Van. The first Urartians were called Nairi by the Assyrians and inhabitants of Asia Minor and their homeland was frequently called Urartu, while the Urartians referred to their nation as the Land of Biani. The ancient Phoenicians in Tyr (Today, city of Sour in modern Lebanon) and Sidon (Today, city of Saida in modern Lebanon) and the Hebrews knew the Urartians and had exchanged trade and commerce with them. The Hebrews gave the Urartians the name of Ararat as it was mentioned in the bible. And Ararat became Armenia in Greek, Coptic, Latin and Arabic. A short segment in the Book of Jeremia , in the fourth reign year King Zedekiah, circa 594 B.C., the Urartians were referred to as Ararat. Another passage in the Bible told the story of the sons of Senharib (Sennocherib) who have killed their father and took refuge in the land of Ararat “Urartu”. Coming on the wave of the Indo-European migrations into Asia and the Mediterranean, the cultures were in close contact with those that developed in Mesopotamia, sharing ethnic and cultural totems among them. Federations formed and reformed between the "tribes" in the region during most of the Bronze Age. The territory was described as a rich land between the rivers, with their head at the "mountains of the gods" (described as "Arartu" in "Gilgamesh") a ca. 4000 BC Sumerian story, considered the first epoch. In the same epoch the land of Arartu was called the birthplace of humankind, the font of civilization, and to travel there and back, a person had to "go by land, return by water", which perfectly describes the mountainous and river terrain in Armenia). When the Massoretic scholars were in their first process of vocalizing the text of the Old Testament, they inserted the vowel “a” into their own language’s words, thus 'Urartu' mistakenly became 'Ararat'. The Assyrian kings Salmanazar the first, Tukulti-Ninurta the first, Teglath-Phalazar the first and Salamanazar the third campaigns against Urartu were vividly recorded and described how advanced the Urartians were in metallurgy, art, architecture, sculpture gold and silver artwork, military crafts and, particularly, how formidable the Urartians were in their resistance and military tactics. The Assyrians records included lengthy descriptions of the magnificent Urartian fortresses, the Urartian bronze and iron swords and shields, their cities, fortifications and ramparts. Assyrians and Hittites feared only one enemy: The People of The North. They meant by that: The Urartians! In time of war, the ancient Urartians-Armenians were an incredible war machine. In time of peace, they were remarkable artists, sculptors, engineers, architects, designers, irrigation geniuses, temples and cities builders, in short, they were the most advanced artists of their time. Urartians arose from the Hurrians and used a language identical to Hurrian. These strong and tenacious inhabitants of mountains and high hills erected gigantic and great fortresses throughout their highlands. Palace, castles, ramparts, fortresses, cities fortifications ruins and sites remains reveal a majestic past and a glorious and economic might. Urartians were remarkable artists especially in sculpture, architecture, palaces and houses exterior and interior design embellished with unusual and innovative balconies, verandas, windows, towers, entrances and gates made from carved stones and ornamented iron. The interiors of their houses were decorated with exquisite bas-reliefs, motives, circular and rectangular patterns and compositions embossed with an astonishing variety of colors and shades. Many houses, regardless of the social, political and economical status of their inhabitants, had an integral water supply and practical drainage system. Their gold and silver artwork, figurines and statues enriched with mythological patterns, symbols and designs ranging from images of sacred trees protected by angels, magi, genii to monarchs, kings, priests, gods and goddesses. Urarturian architecture was predominant and influential in the Middle East, Near East and Asia Minor. One of its most characteristic features was the blind arch which later on in will be copied and adapted by Persians, Greeks, Italians, Phoenicians, Hittites, Assyrians and the majority of the inhabitants of Asia Minor. Similar thing will happen again in the years and centuries to come, when the Cilician architecture began to influence and shape up the architecture of the fortresses and castles of the Crusaders in Lebanon, Jordan, Palestine, Cyprus, Malta and Syria and the European majestic cathedrals and churches. Right after the fall of the mighty empire of the Hittites, and at the dawn of the first millennium B.C., a new kingdom was created in the eastern part of Anatolia in Asia Minor. This remarkable kingdom was Urartu which flourished from the 9th century to the 6th century B.C. and enjoyed a formidable military and economical powers. The Urartians were related to the Hurrians and to the Hittites from whom originally they adopted many of their traditions and customs and particularly the shape and form of monarch faces, beard style, hairdo and attire they depicted later on in their artifacts, tablets and inscriptions in the first millennium, but, later to create their own style and way of life including particular characteristics in art, architecture, fashion and metal work art. Urartu’s remarkable status, power and prosperity in the ancient world were recorded in 13th century B.C. At the beginning, during the very early days of Urartu, Urartians were grouped into a series of counties called Nairi by the Assyrians and neighboring tribes before it became a mighty kingdom in 860 B.C. under Aramu, its first king (860-840 B.C.) and followed by Sardur the first (840-830 B.C.) its second powerful king. 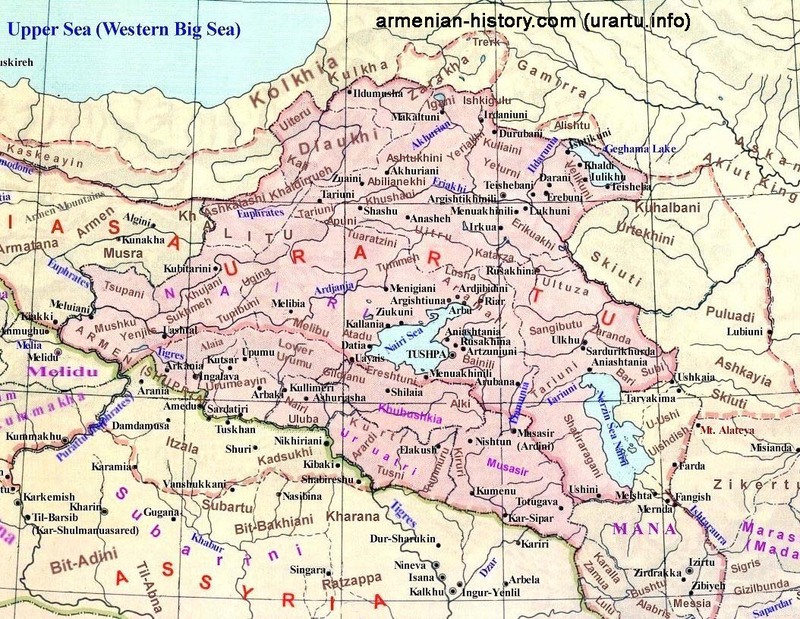 Historically, Armenia as a nation was first settled in 6,000 B.C. by the Thracian-Phrygian tribes that crossed in Anatolia from the Balkans. The early Armenians established themselves as a new ruling and imposing aristocracy imposing their Indo-European language on their neighbors, surrounding nations and almost half of Asia Minor. In 590 B.C. ORIGIN OF THE ANCIENT URARTIANS: Where did the Urartians come from? Who are the Urartians? Photos from L to R: #1. Armenia’s bronze age figurines. #2. Ancient Nairi bronze figurine, early iron-age. "country or land of rivers", and contemporary Assyrian accounts describe about 60 different tribes and small kingdoms and about 100 cities included in this land. From what we know of the tribes in Nairi , indigenous customs and traditions were similar to those found in Mesopotamia, and some were of Semitic or Ugaritic origin. This suggests that Ancestral Armenians are descendants of other, older cultures in the region. However, recent discoveries and studies have turned the tables on history, showing that the cultures that developed the "Cradle of Civilization" are now pre-dated by Ancestral Armenians in Armenia's Cradle by at least 2000 years. The "people" in this description were an alliance of tribes led by a dominant tribe, the Nairi. They were by now more than tribes; they were city-states in a common alliance. The Nairi alliance was based around Lake Van, which together with the Ararat Valley has the most fertile land in Western Asia, as well as the largest mineral deposits in Asia Minor and Mesopotamia. Photo: Close-up of Sarduri the second helmet, 8th century, B.C. As a part of the land and people interchangeably called "The Nairi", Urartians were recognized as early as 2000 BC on Assyrian cuneiform as coming from the "land between the rivers", a land known to hold about 60 tribes and 100 cities. Until their rise, Urartians were subservient to a tribe also called the Nairi, which were in turn one tribe among many, but they held a predominant position during the 2nd millennium BC, and became the namesake for the entire region. Beginning about 2000 BC, the Assyrians used the term "People of the Nairi" to describe the peoples on the Armenian Plateau. The territory and people both were called Nairi, but the word meant "country or land of rivers", and contemporary Assyrian accounts describe about 60 different tribes and small kingdoms and about 100 cities included in this land. From what we know of the tribes in Nairi , indigenous customs and traditions were similar to those found in Mesopotamia, and some were of Semitic or Ugaritic (Ougariti) origin. This suggests that Ancestral Armenians are descendants of other, older cultures in the region. However, recent discoveries and studies have turned the tables on history, showing that the cultures that developed the "Cradle of Civilization" are now pre-dated by Ancestral Armenians in Armenia's Cradle by at least 2000 years. The "people" in this description were an alliance of tribes led by a dominant tribe, the Nairi. They were by now more than tribes; they were city-states in a common alliance. The Nairi alliance was based around Lake Van, which together with the Ararat Valley has the most fertile land in Western Asia, as well as the largest mineral deposits in Asia Minor and Mesopotamia. The Nairi were one tribe among many, but their name became synonymous with that for the entire region. From what we know of the tribes at this time, their customs and traditions were similar to others found in Mesopotamia, and they mixed Semitic or Ugaritic origins with their earlier Indo-European genetic and cultural roots. Among the tribes in Nairi was one called Urartu. About the word Nairi: The Armenian letter "i" (sounds like "ee") can be traced to 15th c. BC inscriptions for water. Both the Nairi and the Haius used this sound/symbol, as did the Assyrians. Thus, the word "nair" meant land, and "i" stood for water/rivers. The land of rivers north of Mesopotamia is that between the Euphrates and the Tigris, which flow from tributaries and sources above and below Mount Ararat. Ararat was already known as the mountain of the gods, and the territory was one of the major trade routes from Asia. The Nairi were considered a force strong enough to tackle both the Assyrians and Hittites, and populated a large territory rich in resources. They were attacked by the Assyrian king Tukulti-Ninutra I, and inscriptions found at the Assyrian palace at Assur tell how 43 kings of the lands of Nairi rose up against the Assyrians, were defeated and brought to Assur in chains. The Nairi offered ransom to the king, tribute was extracted from them, and a new honor was added to the official style of the Assyrian king, "king of the lands of Nairi". Photo: Cuneiform commemorating Erebuni birth, 782 B.C. The Urartians were conquered, vanquished and overthrown by the Medes. Short after its destruction, the magnificent kingdom of Urartu vanished from history and the memory of humankind and was totally forgotten. But, thanks to the discovery of the Scroll of the Dead Sea (Jars of Umran), the contemporary excavations in Mesopotamia, ancient Palestine and Umrit (Amrit, ancient Phoenician city in Syria), ancient Assyrian and Phoenician terra-cotta tablets and inscriptions found in cities in the Near East which contained accounts and historical records pertaining to the kingdom of Urartu and its remarkable cities and temples architecture , fortified cities, ramparts, garrisons and fortresses of the kingdom of Urartu such as the garrisons of Erebuni, Karmir Blur, Toprakkale and the temple of Mousasir which were very-well known to the ancient civilizations and were mentioned in the official records of the Assyrian empire. Unfortunately, none of them survived. Photo: Bronze plate of Balawat representing the campaign of Salamanzar the third against Urartu. Ancient Urartians quickly realized and discovered that Armenia’s soil and terrains were rich and abundant with deposits of iron, copper, lead, aluminum, mercury, zinc, silver and gold. Those discoveries caused the early development of metal work and various metallurgy. Armenia began mining metals as early as 4,000 B.C. She was the major bronze, tin and copper supplier to Phoenicia, Egypt and Mesopotamia. The Urartian art of metalwork and metallurgy was unquestionably very advanced. Urartu artifacts were exported to Ertruria, Phoenicia, Egypt, Mesopotamia and Phrygia. The excavations of the ancient Urartian site of Garmir-Ploor is considered as one of the most important archaeological discoveries and findings in the Middle East, the Near East and Asia Minor for they included carved ivory, stone, ceramics, metal figurines, pottery and an astonishing wide variety of bronze domestic tools and utensils, military equipment decorated with mythological symbols, forms and animals, daggers, swords, helmets arrows, quivers, shields of an advanced metallurgy, as well as vases, bracelets, earrings and medallions in gold and varied sets of other jewelry. Fortunately and unlike ancient Urartian temples and fortresses which did not survive, many metal work, carved jewelry and other objects were found and kept in churches for safe keeping. Many of those treasurers and marvelous religious artworks in metal and precious stones are displayed or can be seen in Jerusalem, Yerevan, Venice and Vienna. Photo: Map of Ancient Assyria. In 6,000 B.C., Armenia as a nation was first settled by the Thracian-Phrygian tribes that crossed in Anatolia From the Balkans. In 5,000 B.C, Nineveh in Ashur (Assyria) is inhabited. In 4.750 B.C., the first Assyrian temple is erected. In 4,000 B.C., Armenia began mining metals. Around 3,000 B.C., the Hayasa-Azzi tribes first inhabit Urartu. In 2,500 B.C., two Assyrian cities Arbel and Nineveh prosper and their trade flourishes. They become very influential cities in the Middle East. In 1760 B.C., Hammurabi king of Babylonia conquers Assyria and ends the first Assyrian empire. In 1,500 B.C., Mitanni rules Assyria. In 1,363, B.C., Ashur-Uballit establishes the Assyrian Empire. In 1,260 B.C., the Assyrians scribes and inscriptions mention Urartu for the first time. In 1,240 B.C., Babylon is ravaged by the Assyrians. Around 1,200 B.C., the Assyrians resist incursions by the Urartians and the Mushki. Between: 1,114 to 1,076 B.C. mark the reign of Tiglath-Pileser the first over Assyria. In 1,155 B.C., Elam and Assyria attack Babylonia and put an end to the Kassite rule. Around 1,000 B.C., the Phyrgians and the Thracians immigrate to Urartu. Around 1,000 B.C., the Urartians conquer and overrun the majority of the lands of the mighty empire of Assyria. Around 934-935 B.C., Assyria regains and captures the lands lost to the Urartians. Around 900 B.C., The Urartians adopt the Assyrian cuneiform script. In 860 B.C., Aramu becomes the first king of Urartu. Around 859 B.C., the Assyrians regain their lands from the hands of the Urartians. Around 856 B.C., the Assyrian king Shalmeneser the third defeats Aramu, the first king of Urartu. Around 820 B.C., Van becomes the capital of Urartu during the reign of Sardur the first. Around 800 B.C., under the monarch Menva, the Kingdom of Urartu flourishes, prospers and expands. In 782 B.C., at Erebuni, King Argishti the first erects the first Armenian royal capital. In 760 B.C., king Sarduri the second annexes northern Syria. Around 743 B.C., Assyrian king Tiglath-Pileser the third defeats the Urartians and gains northern Syria. In 738 B.C., Assyria attacks Phoenicia and captures Byblos and Sidon. The year 735 B.C. marks the beginning of the Assyrian incursions in the kingdom of Urartu. In 734 B.C., king Tiglath-Pileser the third of Assyria captures Tyre in Phoenicia. In 721 B.C., king Sargon the second of Assyria attacks and captures Samaria, the capital of Israel and deports thousands of Israelites who become the Ten Lost Tribes of Israel. In 714 B.C., the Urartian king Rusa is defeated by the Assyrian king Sargon the second who first attacked and destroyed Mettati, Urartu’s ally. Because of its wealth, abundance and prosperity Urartu had to pay a very heavy ransom. To the Assyrian king. Sargon imposed upon the Urartians: One ton of gold, five tons of silver and thousands of objects, materials, tools, and instruments such as 393 silver cups or chalices, 25, 212 bronze shields, 305, 412 bronze swords, etc.). The year 707 B.C. marks the beginning of the multiple attacks of Cimmerians on Urartu. In 701 B.C., Assyria attacks Israel, ravages Jerusalem and captures almost all the cities and ports of Phoenicia after fierce battles with the Phoenician and a long standing siege of the half-isle of Tyre, exactly as it happened with Alexander the Great of Macedonia who took him 9 months to seize the whole land and the small island of Tyre. In 689 B.C., The Assyrians destroy Babylon. Around 680 B.C., at Rusahinili, Urartian king Rusa the second builds a new capital for his new kingdom. From 671 to 651 B.C., the Assyrian rule Egypt. In 612 B.C., Nineveh in Assyria falls under the attacks of the armies of Medes and Babylonia. In 609 B.C., Babylonia and Medes joins forces and conquer Assyria. They defeat Ashur-Uballit the second, the last Assyrian king at Harran. In 590 B.C., the Urartian capital Rusahinili is decimated and completed destroyed by Medes. In 590 B.C., Urartu was sacked, burned and totally ruined. The Urartian kingdom begins to fall and declines and never to rise again. In 585 B.C., Urartu is totally annihilated by the Scythians.